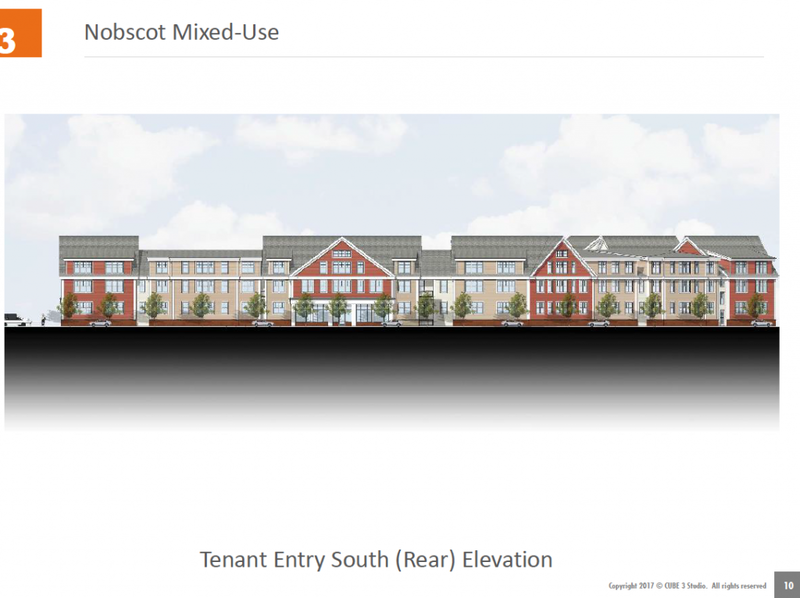 FRAMINGHAM – More than 100 residents attended a Meet Your City Councilors event at Heritage to find out what will become of the Nobscot Plaza. The meeting included the city councilors within the Nobscot area, District 1 Charlie Sisitsky, District 2 Pam Richardson, Adam Steiner of District 3, at-large Councilor Cheryl Tully Stoll, at-large Councilor George King, and Mayor Yvonne Spicer were in attendance. The discussion was heavily focused on the plans for the Nobscot Plaza. Councilor Sisitsky said Andy Rose, the owner of the plaza, expressed excitement in meeting the new city government, and has already had conversations with several of the City Council members, including himself. Two major concerns surrounding the repair of this plaza are the relocation of the chapel and the improvement of the intersection in the surrounding area. According to Sisitsky, Rose has offered to provide the $250,000 to 300,000 it will take to relocate the chapel. Rose also offered to pay for the foundation of the building, the repair of the building and the upkeep of the building. Former Framingham Planning Board member Sue Bernstein asked whether or not there was currently a planned spot to which the chapel would be moved. Though this is one proposed idea, the plans are subject to public proposals. In order for this area to be successful, public input is important. City Councilor Adam Steiner, who used to live by Nobscot Plaza while it was still flourishing, expressed his passion for this project. During Andy Rose’s meeting with the councilors in February, he presented his ideas for the nearly vacant plaza. 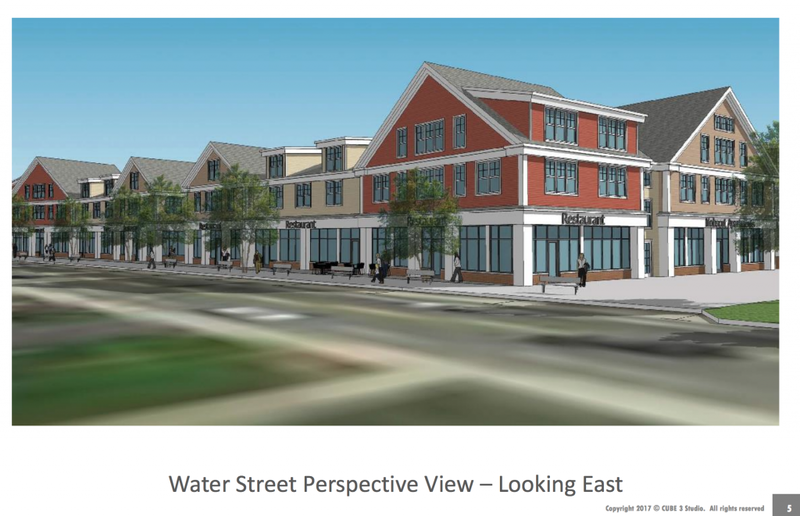 Rose hopes to build an apartment complex that will be accompanied by a few retail spaces. According to Councilor Richardson, Rose’s proposal included a triangular-shaped apartment complex that would house 150 apartment units. In the center of this area would be a courtyard with a swimming pool. There would then be around 8,000 square feet left over for retail spaces. “In the mornings, and at 3:00 and at 5:00, it’s very difficult to get off the street to get onto Water Street, and housing is definitely not what we would like to see there…it’s going to change the whole character of the neighborhood, it’s going to change the way the sun hits everything, it’s going to be very dense,” said one rsident last night. In addition, she shared that the current CVS in the Nobscot Plaza is around 8,800 square feet. That is more space than Andy Rose plans to devote to the entire retail portion of the new plaza. Richardson believed that the public’s input is important to this project. She believes everyone, not just city councilors, should fully understand the plans. “My takeaway from this meeting is that there needs to be another presentation about the proposal that Mr. Rose has to get everyone up-to-speed,” Richardson said. Planning Board Administrator Amanda Loomis also spoke to the concerned crowd to share her role in redeveloping the Nobscot Plaza. Loomis shared her plans to develop “B-3 Zoning”, also referred to as “Village Zoning”. 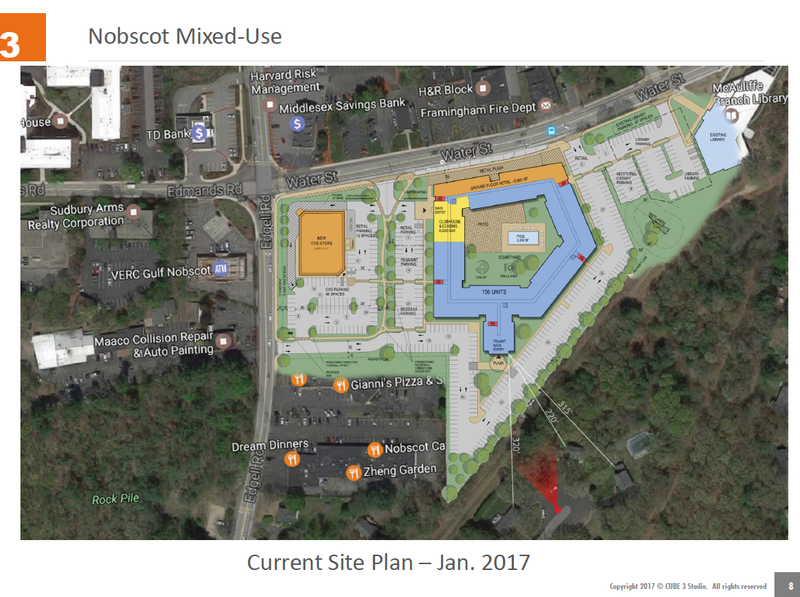 The Nobscot Plaza is currently under B-2 Zoning, which is classified as “Commercial Business Zoning. “That’s what this is, it’s a village that we want to create,” she said. 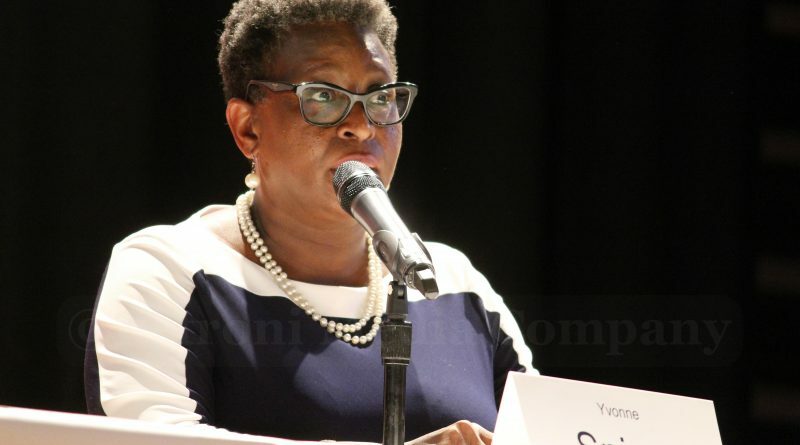 When prompted to the podium to share her experience with Rose and with this specific project, Mayor Spicer said she had not yet taken much action. Spicer went on to emphasize it was hard to have an effective conversation about Andy Rose without him actually being present at the meeting. The Mayor asked the community to develop solid, concrete plans of their own for what they would like to see in the Nobscot Plaza. “Here’s what I’m going to ask you, what would you like to have? How do we come to Andy Rose with what we want to have? And to do it in a way that makes good sense,” she said. Spicer assured the community that she will present the ideas they come up with to Rose when the opportunity arises. She made it clear that approaching him in a smart, careful way would be important to have the public’s comments considered. “I will present it in a way that makes good sense for our community. As I said, we have to think smartly about how we proceed,” Spicer said. 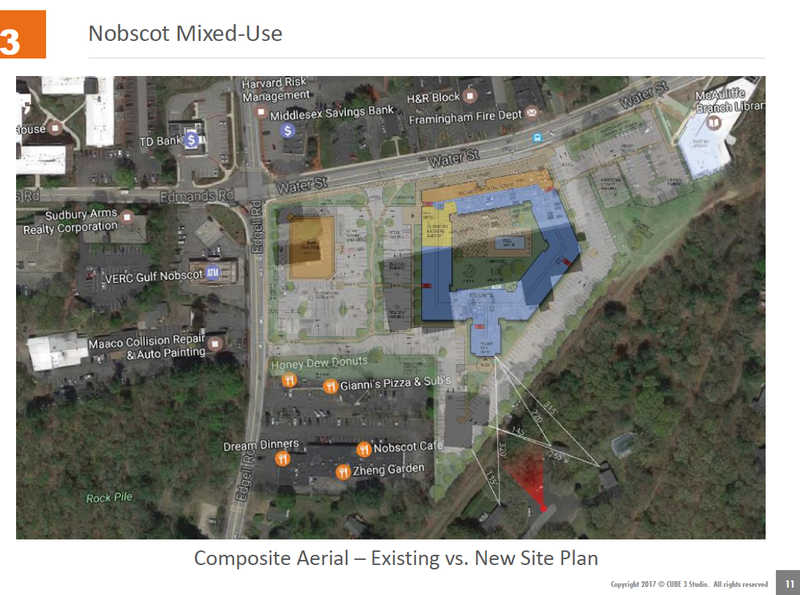 The Planning Board will present on B-3 Zoning and the appeals surrounding the Nobscot Plaza at its next meeting on March 15 in the Ablondi Room. Community members are encouraged to continue developing ideas of what they would like to see for the Nobscot Plaza. “We also have to think about what it is, keep in mind, that we are preparing for our children’s future. That’s what we have to think about when we do development or anything, it’s not just for us, it’s for those that will come after us. Because the decisions we make today have a longstanding impact,” Spicer said.